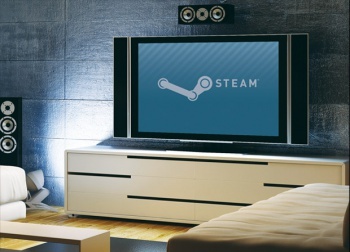 Valve is exploring the possibility of utilizing Steam on additional hardware. First teased in early 2011, Valve's Big Picture Mode is becoming a reality. The service will go into beta early next month, allowing gamers to use "see Steam reformatted for your TV and usable with a PC game controller or a mouse and keyboard." As Valve's Greg Coomer points out in a recent GameTrailers TV interview, "there are some games that are better made for a controller input," such as PC ports of console games, for which Big Picture would be ideal. Of course, those who prefer the mouse and keyboard can stick with them and still enjoy seeing their games optimized on a big TV screen. Valve wasn't clear on exactly how Big Picture will work, but the Steam website states that it "doesn't require any additional development" from gamers. It's easy to speculate that Big Picture could lead to the long-rumored Steam console, and the possibility of using additional hardware to bring Steam to televisions hasn't been ruled out completely. In the same episode, Gabe Newell said, "We show hardware guys and say, 'if this is a useful tool for you to deliver your hardware in the living rooms, that's great. And if you want to run it on top of Windows that's fine, and if you want to run it on top of Linux that's fine.'" With the Big Picture beta due to start in "early September," it shouldn't be much longer until more specific details are revealed. Coomer did mention that "everything'll be there," meaning your entire Steam library should be available on your television once Big Picture is up and running.